In the face of injury, Galatasaray rises to the occasion! Shaking off injuries that have sidelined four of its top players in the last month, Galatasaray Liv Hospital won a battle of pride 84-74 over visiting FC Bayern Munich to close the first half of the regular season. The victory left both teams with 3-2 records, tied for second place in Group C. Galatasaray came out strong and led by as many as 18 points early in the second half, but Lucca Staiger of Bayern buried 2 three-point shots within 11 seconds to make it a 74-70 game with 1:40 left. Carlos Arroyo matched those shots in the final minute, however, letting the spirited Galatasaray fans enjoy a victory at the end of a week in which Erwin Dudley and Jamont Gordon joined both Nate Jawai and Manuchar Markoishvili on the team's long-term injury list. 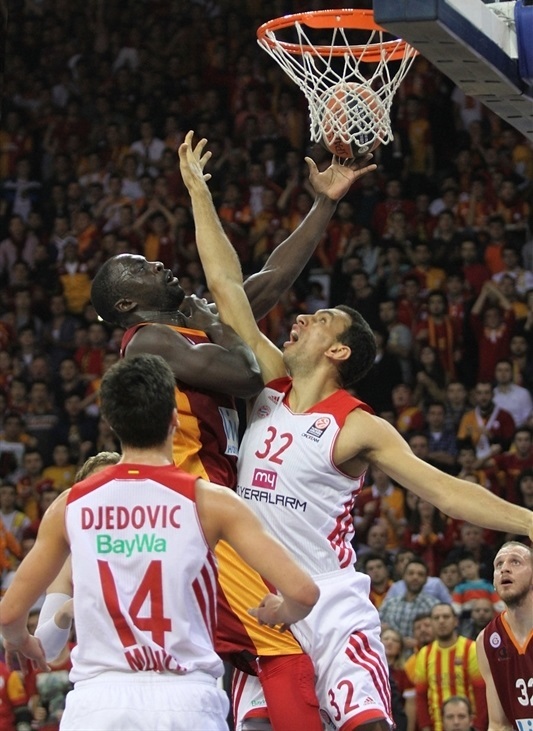 One of their replacements, Pops Mensah-Bonsu, was spectacular for Galatasaray, finishing with 19 points and 13 rebounds. Arroyo followed with 18 points on 6-for-9 three-point shooting and 6 assists. Ender Arslan added 14 points off the bench, Cenk Akylol 11 and Henry Domercant 10 for the winners, who also got 10 rebounds from Milan Macvan. 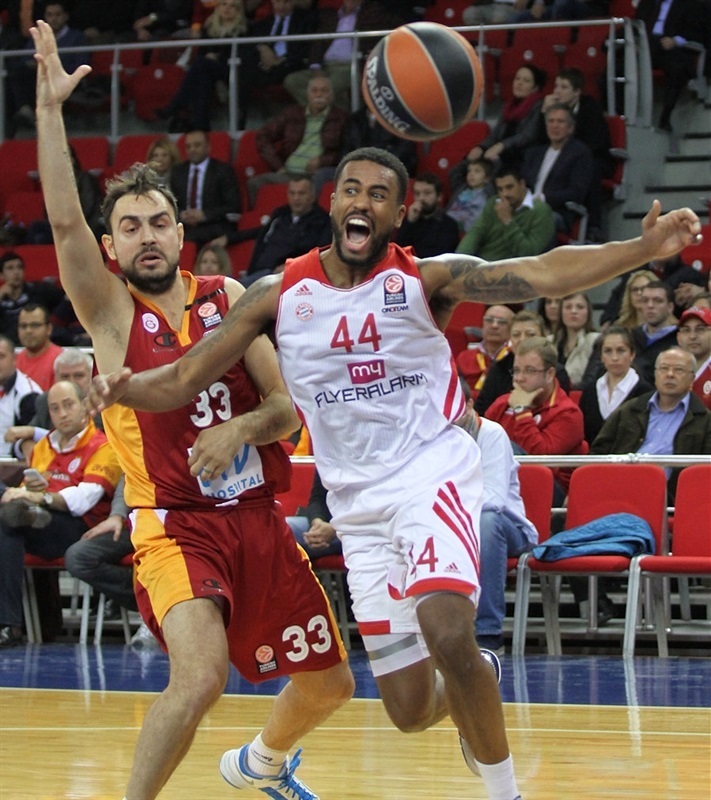 Bayern had one double-digit scorer, Chevon Troutman with 15 points, while the Galatasaray defense held Malcolm Delany to 6, which was 11 below his team-leading average. First quarter: The Carlos and Pops show! In a sign of things to come, Arroyo and Mensah-Bonsu connected for a power slam to start the scoring. Bryce Taylor's tip-in and an easy driving layup by Delaney put Bayern in front briefly 3-4. 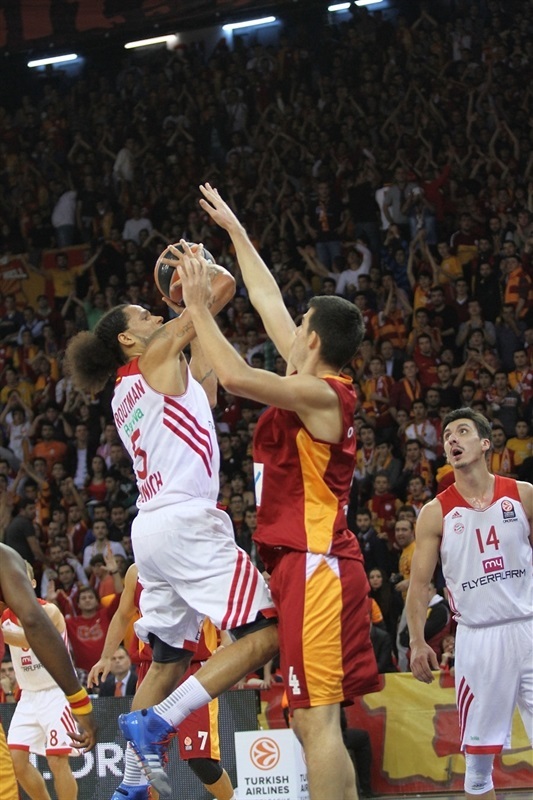 But Arroyo found a three-pointer and Mensah-Bonsu another dunk as Galatasaray went back ahead. Lucca Staiger took back 2 points with a quick jumper, but Arroyo struck again from downtown to make it 10-6 for the hosts. 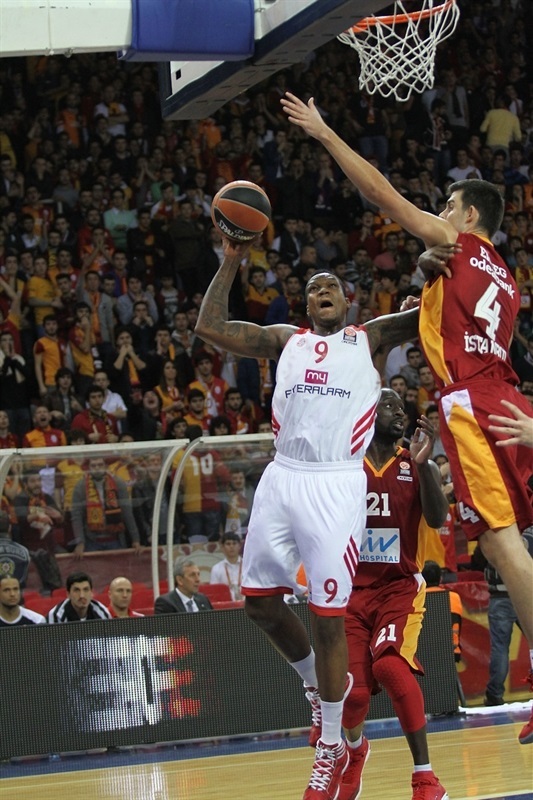 Mensah-Bonsu slammed home an offensive rebound before Arroyo buried his third triple on the break as Galatasaray suddenly led 15-6, forcing a Bayern timeout. John Bryant came off the bench to put back a rebound before Taylor stole and dunked to steady the visitors. Akyol answered with a triple and Huseyin Koksal finished a break to double Bayern on the scoreboard, 20-10, before Arroyo and Mensah-Bonsu connected on another pair of pick-and-roll alley-oops and the lead reached 24-13. Robin Benzing hit a jumper for Bayern but Mensah-Bonsu was unstoppable, scoring again for his 12th point in less than 10 minutes. Akyol still had time for a three-pointer as Galatasaray seemed to forget its injury woes away with a 29-15 lead after 10 minutes. 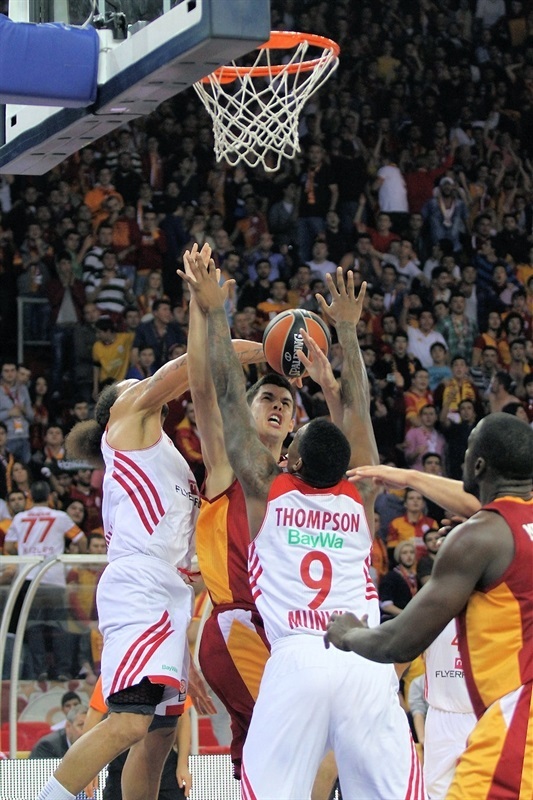 Troutman's free throws and a basket by Yassin Idbihi re-started Bayern in the second quarter, while Akyol popped a shorter jumper for Galatasaray at 31-19. 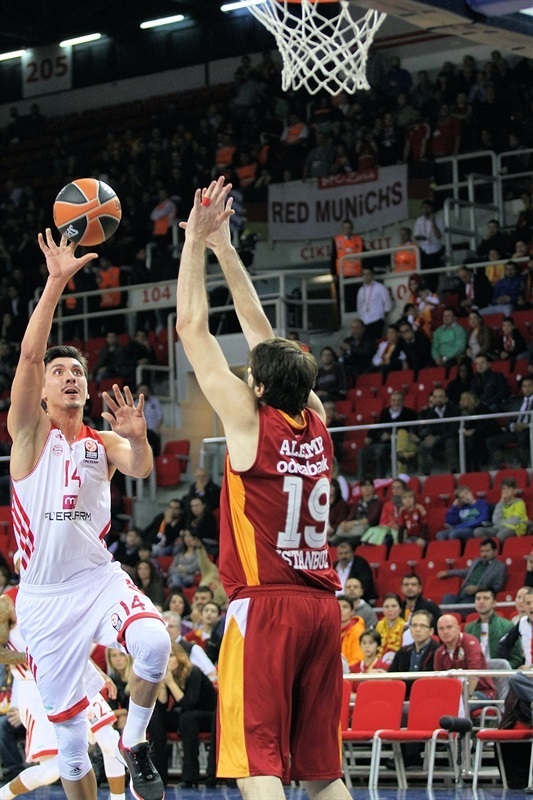 Nihad Djedovic drove for Bayern to end a couple of scoreless minutes, but Macvan got those 2 points back, plus an additional free throw, on his put-back for Galatasaray. When Domercant got his first points on a runner and Arslan split the Bayern defense, Galatasaray suddenly had its high lead, 38-22. Bayern got a much-needed fastbreak dunk from Boris Savovic, but left Domercant open for a triple. Savovic got 2 put-backs for Bayern but Mensah-Bonsu and Arslan negated those with 2 free throws each. Mensah-Bonsu finished his spectacular half with a put-back but fouled Delaney, who hit both his free throws, leaving a 47-30 score at halftime. Deon Thompson got Bayern's scoreboard re-started and Savovic added a nice reverse to quickly trim the difference to 47-24. Mensah-Bonsu resumed his point collection and Sinan Guler joined him in the scoring column as Galatasaray staked the game's newest high lead, 52-34. Troutman steadied Bayern with a corner triple then, but Macvan fed Akyol for the same shot. Mensah-Bonsu committed his fourth foul and had to take a seat as Troutman made both free throws and Bayern went inside to Idbihi to lower the difference to 55-41. Guler answered with a layup that Troutman equaled with a reverse. A lull in scoring ended with Djedovic getting 2 baskets around free throws and a baseline runner by Arslan. Troutman added another basket for Bayern to pull within 61-49 after 30 minutes. Arroyo buried a triple in transition to open the final quarter before Heiko Schaffartzik dropped a tough jumper and a three-pointer, making it a 10-point game again, 64-54. Enter Arslan, who settled down the hosts with a jumper then fed Domercant for a three-pointer at 69-56. After a timeout, Troutman's next basket was met with free throws by Zoran Erceg that Schaffartzik matched for a 71-60 scoreboard with under 5 minutes left. But when Troutman put back a miss, Bayern was within single digits for the first time in the second half. Thompson made it even closer, 71-64, with a transition basket as Galatasaray's shooting went cold, but a great save by Domercant led to Arslan burying a triple just under the 2-minute mark to make the Galatasaray crowd roar. Staiger silenced that crowd in a big way, however. After his three-pointer out of a timeout and a Galatasaray turnover, Staiger buried a second shot from the arc in 11 seconds for a sudden 74-70 difference with 1:40 to play. Arslan got to the foul line to make 1 of 2 shots, then Bayern missed 3 scoring opportunities going into the final minute. With 39 seconds left, Arroyo made the visitors pay with a straight-up triple, and at 15 seconds, he added another for good measure as Galatasaray secured a big victory in the name of its wounded comrades at home. 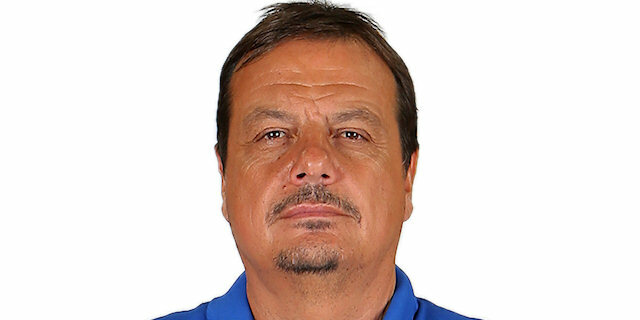 "We played a very critical game. We are going through a difficult time in terms of injuries. We started the game as we wanted. We kept the rhythm up and it worked well for us. Bayern Munich is an organized team. We wanted to keep them out of their order. Arroyo and Cenk were very helpful tonight and Mensah-Bonsu dominated the game under the hoop. We were ahead from the beginning until the end. Carlos’s points were very important and came at the right time. Next week is also very critical. We will play against Siena; we want to win that game and move forward from that point." "Tonight we played two different games. The first 20 minutes and last 20 minutes were very different. Of course we are not happy with the result, but we need to learn a lesson on how to win Euroleague games. 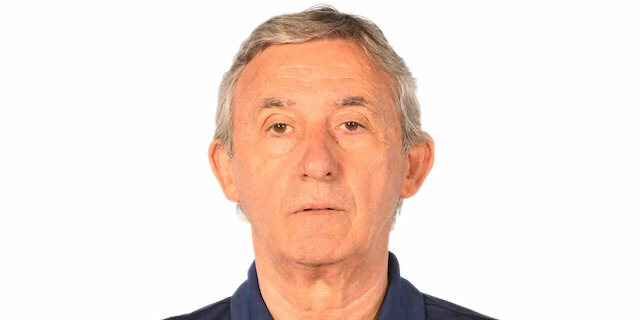 Galatasaray is a very strong team offensive wise and they made all the right choices tonight. It was difficult for us to control the game when they had a high percentage of three points shots. We will work hard to win the next game."